Today, IT organizations are under a great deal of stress to “do more with less”. The growing demands put on data management, along with the expectation that IT will support business goals of reduced cost have left many feeling trapped by their data center. The legacy stack makes the data center environment complex, requiring about 12 different products to deliver the needed functionality. This means that an enormous amount of resources in the form of time and money must be expended to manage it all, all the while sacrificing performance and efficiency. 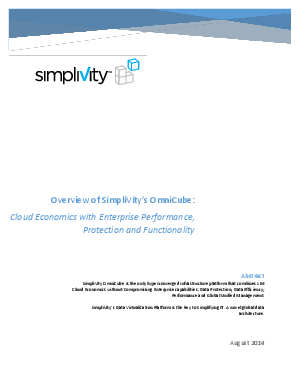 SimpliVity’s hyperconverged infrastructure radically simplifies IT to solve these business problems, and deliver s performance, capacity, availability, and functionality in an all-in-one building block call the OmniCube.